I read this as a buddy read with Jess from Storytime in the Stacks. 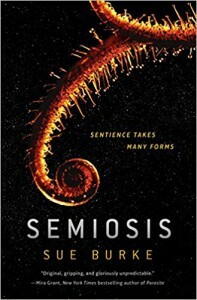 Semiosis was an odd book that evoked many different emotions. I started out loving the book because of the sheer imagination displayed, but was pretty sure at some points that I was going to end up hating it. However, my affection for the book would gain ground again just a few chapters later. I can't say I outright loved the book, but I actively wanted to finish it - and that's been difficult for me to do lately. There are aspects of Semiosis that don't make a lot of sense, but you can put them aside for the sake of the story. For example, at one point there's a super small amount people on Pax. Assuming an equal distribution of males to females, and fertility for all, that's still not really a firm ground for genetic diversity to avoid inbreeding and stuff. There were some balances put in place initially, but they're done away with fairly early on. And then additional complications are brought into play. So, yeah, the fact that several generations down the road there's no visible signs of issues there gives me a little bit of pause. The time skips were a little bit weird because there was no real order to do them. It was like the author used them to move past the parts of the story that she didn't know how to handle. A way of just writing the good parts, you know? It ended up working out in the end, but it was one of my least favorite aspects of Semiosis. In some ways, Semiosis felt like it was a bit of a riff on the Harry Harrison's Deathworld novel. In fact, when I read some of the first praise for it, I thought "Haven't these people read Deathworld? It's not that original." But though there are some basic similarities, Burke definitely developed Semiosis into her own story, and it really was completely unpredictable. One of the things that I think will stay with me for a long time is something that the characters talk about early on. Human beings realizing that they couldn't bring their environment with them. That they needed to find a place to fit in with the local environment, not force the local environment to adapt to them. In a time where science fiction seems obsessed with interstellar wars and focuses on the knowns such as the asteroid belt and the rocky planets, to read a book like this is a sheer pleasure. It shows that there are still science fiction writers out there that are capable of cultivating nearly neglected ideas and growing them into a book you haven't read a variation on five hundred times before. Yes, there's been plenty of first contact novels, but there's only been a few like this. Overall, Semiosis is a strong showing from Sue Burke. The plot is solid, the pacing wobbles a bit but stays interesting, the world is captivating, and it ends absolutely perfectly. I hope that any forthcoming novels from her are just as creative and interesting. It's worth checking this one out, y'all, if for no other reason than it's a great change of pace.